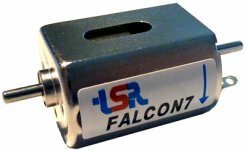 TRM02 - TSR Falcon 7 High Performance Racing Motor [TRM02] - $12.95 : TSR Slot Cars, TSR Slot Cars - Dedicated to Slot Car racing, collecting, restoration, track design, electronics and software. The Falcon 7 is back! "Falcon 7" racing motor. This potent racing motor is designed for multiple use on 13.5 DC maximum voltage. This motor has a timed commutator and must be run clockwise when seen from the pinion side. Legal for most Retro Racing series worldwide. It has a dual shaft allowing the use of a pinion on either side or of a commutator cooler desirable for endurance racing or with undesirable higher voltage. NOTE: This motor is NOT suitable for TSR cars as its rotation is opposite to that required. WARNING: Maximum recommended voltage: under 13-Volts. Check voltage on DC power packs supplied in standard racing sets. Requires 2-amp minimum current. Failure to use a proper power supply may damage this motor. WARNING: correct rotation is clockwise when seen from the pinion side of the motor. Do not use in incorrect rotation as it will damage the motor.